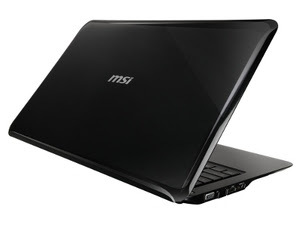 If you are looking for Ultra-portable laptops, then this one's for you: MSI X600 X-Slim Series. The new MSI X600 X-Slim Series weighs just 4.6 pounds and its only 0.98 inches thick at its thickest point. The MSI X-Slim Series is powered by 1.4GHz Penryn SFF C2SULV SU3500 Processor, Chipset GS45+ICH9M-SFF. MSI's unique ECO Engine power management function helps extend the battery running time while performing different tasks, and you can easily switch between five different modes--Gaming, Movie, Presentation, Office, and Turbo Battery (minimizing battery power consumption). The new MSI X600 X-Slim Series supports the next generation eSATA port with a transfer speed of 3GB/s and with it, greater efficiency. It has a built-in a 1.3-megapixel webcam and an internal mic mean you can share your video experiences without missing a beat. The beauty of MSI X600 X-Slim Series comes with glossy lid with a painted MSI logo is the only design flourish. The rest of the X600 is matte black -- the perfect colour for its low-key good looks. You can also get the X600 in white.